iPhoneGlance Press release Take Your Golf Gambles to the Next Level with Golf Money for iOS! Take Your Golf Gambles to the Next Level with Golf Money for iOS! 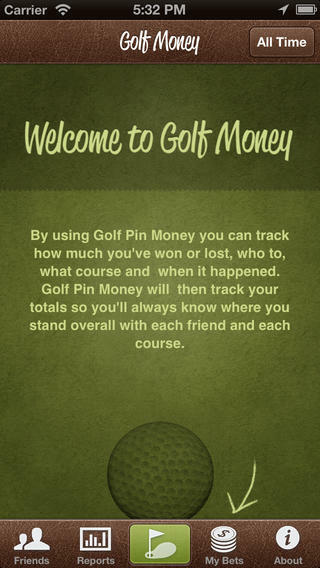 Scottsdale based POD LLC today announces the release of Golf Money for the iPhone, iPad, and iPod touch. Golf Money gives users the power to record every golf bet they make in real time, track their play by course and opponent, and input handicaps. This is the perfect app for golf gambling lovers eager to track their betting history, see win/loss records, and stay ahead of the curve while out betting golf with friends. Scottsdale, Arizona – POD LLC, a burgeoning mobile applications developer, is excited today to announce the launch of Golf Money onto the App Store. Universally compatible across all iOS devices, this unique golf betting companion gives users the power to keep their golfing performance, bets, and more all together via a single intuitive hub that’s always available right at their fingertips. Users are free to add in contacts, track results and past bets by opponent and course, and review gambling history for any timeframe. Golf Money is currently available for download at promotional pricing of $0.99 in the Sports category. Golf enthusiasts that enjoy wagering on their golf games know that keeping track of wagers, wins, and losses can become a complex, confusing proposition quickly. Golf Money was created for golfers by golfers to solve exactly this problem. The app utilizes four straightforward modules which together give users the tools they need to track every aspect of their golf gambles including who they’re betting against, current bets, and everything else in between. Users can add anyone they’d like into the app, designate them as partners or opponents, create teams and handicaps, agree on bets hole by hole, and do it all before they ever step foot out onto the green. Not content to be a single use app, Golf Money also features full betting and performance bookkeeping functionalities, meaning that users can review and scrutinize everything from their lifetime earnings, to performance histories against specific players or on specific courses on demand from anywhere. Meanwhile, the app enables users to keep track of bets from a single location without ever needing to put pen to paper or track how their games unfold from memory. Don’t ever go into a golf game with money riding on it blind again. Get Golf Money today and always keep yourself organized and in the know while out on the tee. Founded in 2003, POD LLC is committed to bringing high caliber applications to a diverse array of clients. POD LLC creates their mobile products for today’s savvy media consumers. © POD LLC. 2013. All Rights Reserved. Apple, the Apple logo, iPhone, iPod and iPad are registered trademarks of Apple Inc. in the U.S. and/or other countries.